Hauschka, who has been with the Seahawks since 2011, became an unrestricted free agent following the end of last season. 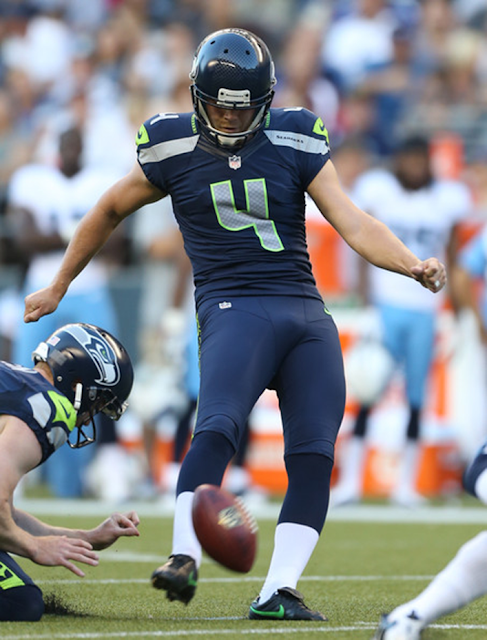 Kicker Steven Hauschka re-signed with the Seahawks, the team announced Friday. Hauschka, 27, has made 49 of 57 field-goal attempts (86 percent) since joining the Seahawks in 2011 with a long of 52 yards in each season. He made 23 of 23 field goals inside of 50 yards last season and also made a franchise record-tying five field goals in a 22-17 win against the Ravens in 2011. He did, however, make only 1 of 4 field goals longer than 50 yards last year. Hauschka, who had become an unrestricted free agent last month, was injured in the playoffs against Washington and didn't play against the Falcons the next week after being placed on injured reserve. Hauschka's return answers one of the questions surrounding the Seahawks this offseason — the kicking game. Hauschka kept Seattle in a handful of games early last season, particularly while the offense struggled. He made three field goals in a 16-12 win against Carolina in Week 5, made another in a 24-23 win against the Patriots the following week and made 3 of 4 field goals to give the Seahawks a chance against Arizona in Week 1, an eventual 20-16 loss. Hauschka made 11 of 12 field goals last season with the score tied. The Seahawks claimed Hauschka off waivers after the Denver Broncos cut him before the 2011 season.